DURHAM, North Carolina (WTVD) -- Durham Police Department investigators are trying to identify a man and woman who robbed the Circle K at 3308 N.C. 55 Highway shortly after 12:30 a.m. on Sunday. The suspects entered the business and robbed employees of cash at gunpoint. No one was injured. One suspect was described as a black man, 30 to 40 years old, 180 to 200 pounds and 6 feet 4 inches to 6 feet 8 inches tall. He had a scar around his left eye. He was wearing a black hoodie, a black ski mask and jeans. 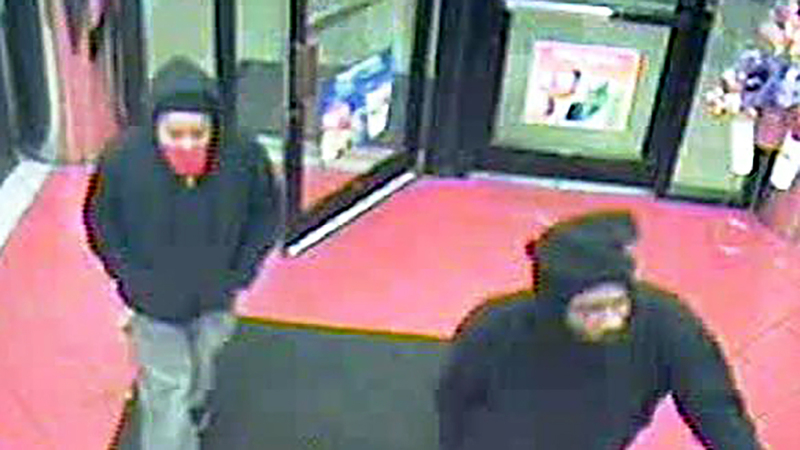 The two suspects in Sunday's Circle K robbery in Durham. The second suspect was described as a black woman, 25 to 30 years old and 5 feet 7 inches to 5 feet 9 inches tall. She was wearing a black hoodie, khaki pants, a black hat and a red bandanna over her face. Anyone with information is asked to call Investigator B. Riley at (919) 560-4440, ext. 29303 or CrimeStoppers at (919) 683-1200.